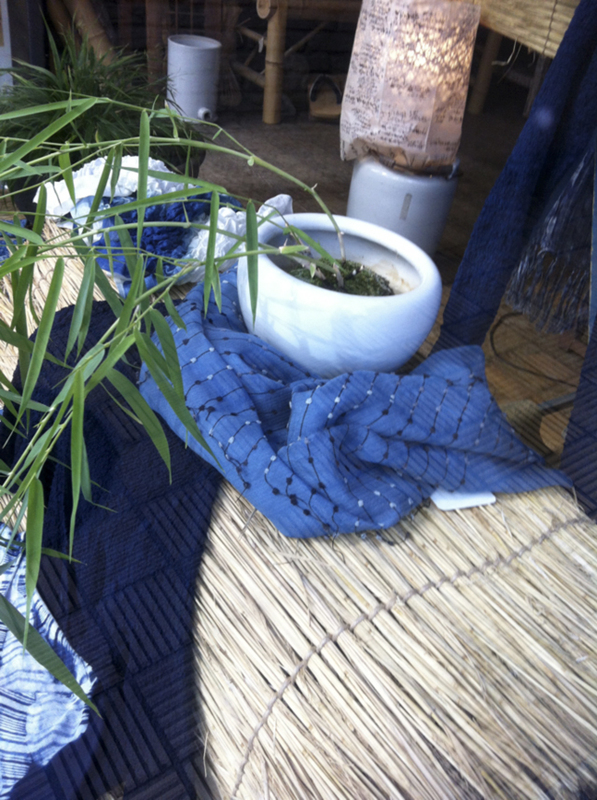 Indigo is the secret language of Japan, communicated on many levels, in many tones and fonts and channels. Historically it was the most readily available dye used for cloth for wearing, for working and for household use – futon, floor mats and cushions. 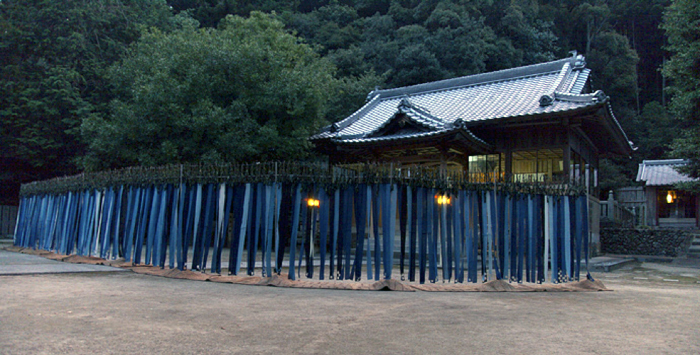 Banners for shrines and temples and shop signs as well as any kind of public messaging were dyed in indigo. Uniforms were indigo as were work clothes. Indigo was the most available color and the indigo message was the one that people noticed and paid attention to. The shades were infinite and the enormous range of one magnificent color may be without equal in the whole color spectrum/rainbow of Japan. A remarkable indigo Ai Art project has been taking place in Tokushima this year called I am Ai, We are Ai. 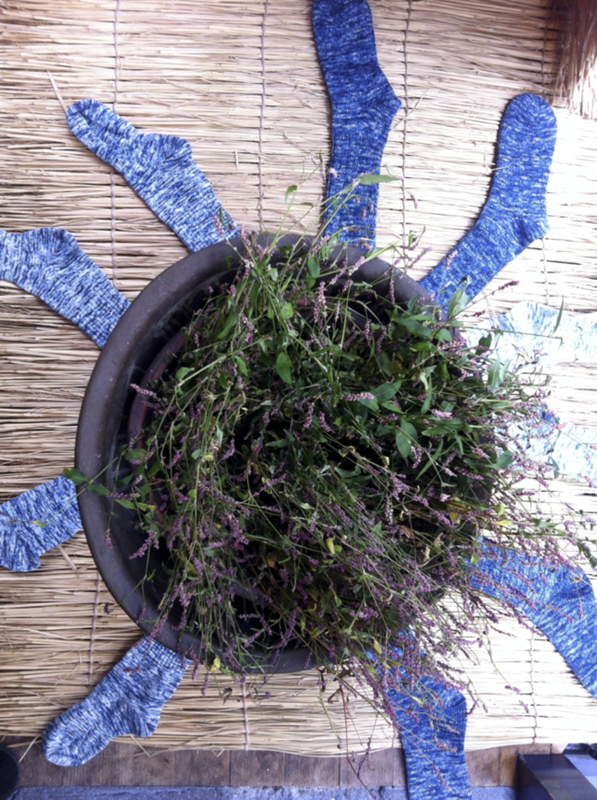 Ai is fortuitously the Japanese word for indigo as well as for love, though the Japanese characters are different. Tokushima, historically known as Awa, in Shikoku is the home of 80% of the indigo produced in Japan and has been the leader in Ai cultivating and trading for over 4 centuries! Rowland Ricketts, an indigo farmer and artist and dreamer, as well as being Professor of Textile Arts at Indiana University in Bloomington has conceptualized and orchestrated this 8 month I am Ai, We are Ai program using Shrines and fields and temples and warehouses and drawing people from all over Japan to join in this remarkable tribute to the indigo of Awa, its glorious history and its promising future. For the fascinating story of the Awa I am Ai, We are Ai Project, click on the link to the website. One indigo dyer we know and champion opted not to join the Tokushima I Am Ai We are Ai project, probably because he experiments with different dyeing techniques – board clamped dyeing, shibori, and specially woven and combined and engineered fibers – all natural, mind you – silks, cottons, gauzes, gossamers – that have been revved up with elasticizing, layering, puckering and mixing. For him just one solid indigo color on simple cotton was not enough and did not tell the whole indigo tale. 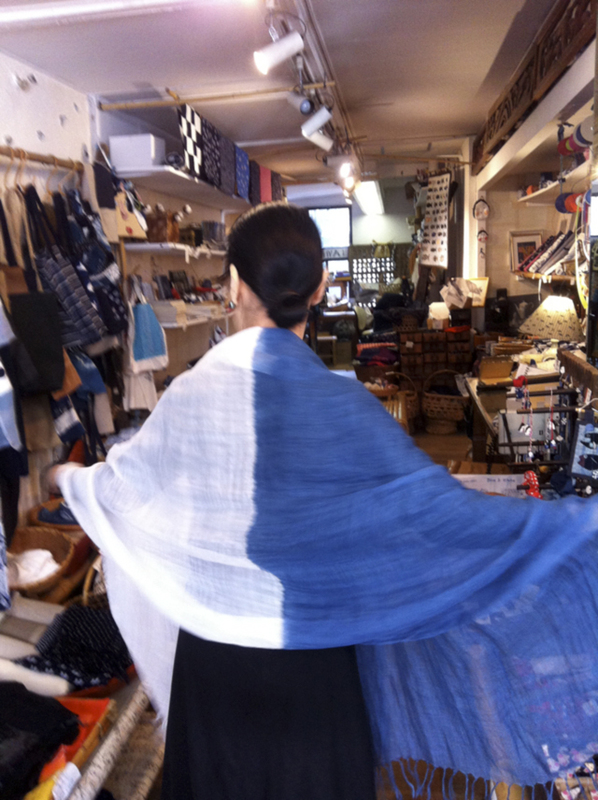 So Noriyuki Murata of Kosoen Dyeworks in Ome, in the hills of Tokyo, chose to send his creations to Blue & White instead (as well as a number of other larger and more significant galleries where he also exhibits). His exhibit at Blue & White has been received with oohs! and ahs! and ais! Have a look! A simple sheer stole with shibori designs. Indigo transparency is addictive! Just one is not enough. 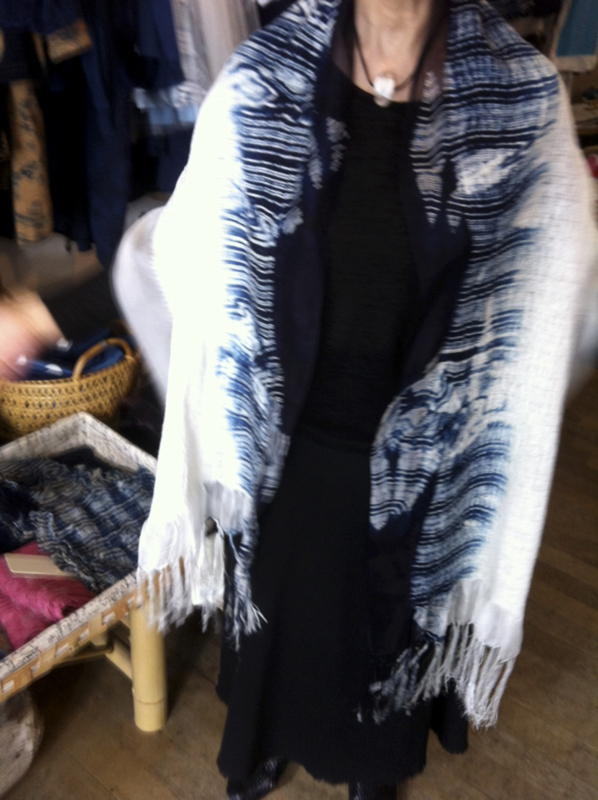 Wrap around stole in mid tone of indigo with blips of random shades of blue fading to white silk. 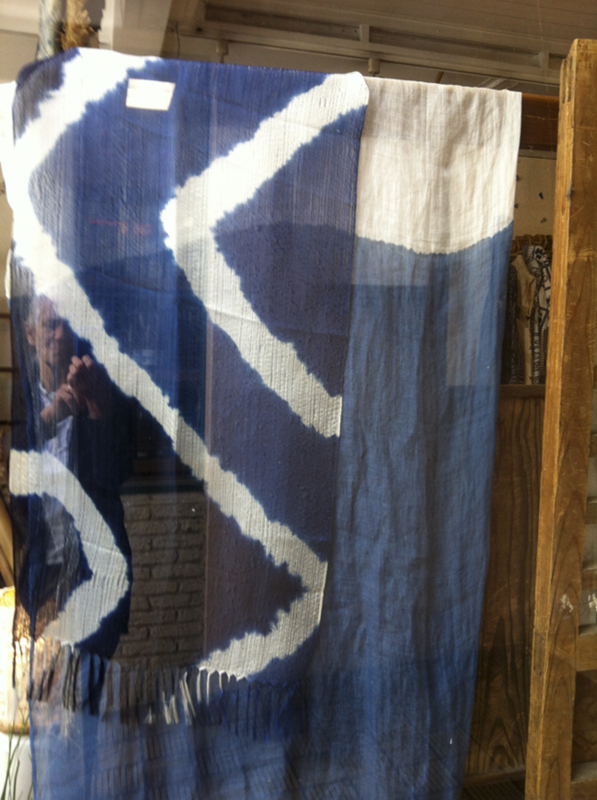 Remarkable sheer silk gossamer stole shot with slubby indigo threads. Wondrous joining of clamped board dyed transparent silk merging with felted silk or is it wool? The magic of mixed media. Indescribably delicious! 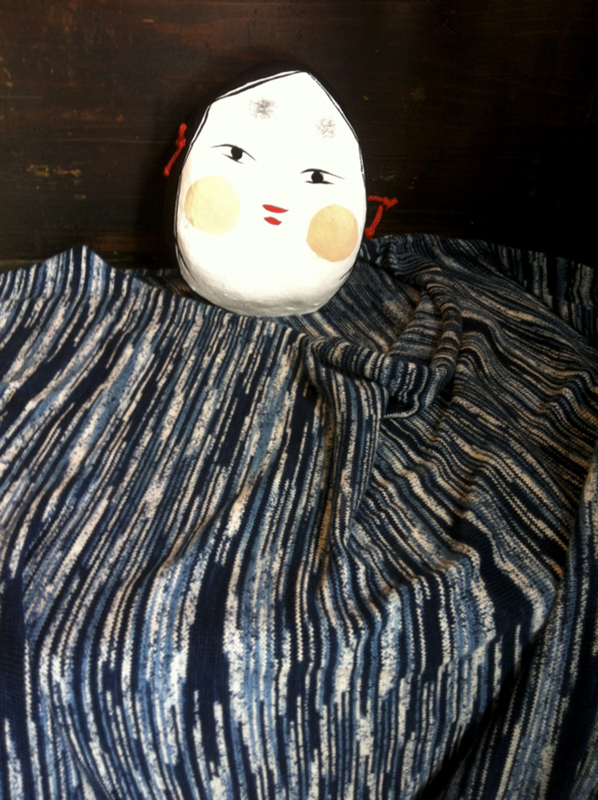 Amazing puckered cotton, with 1% nylon elastic, holds its stylish form while absorbing the tones of indigo beautifully. The first word in Blue & White. 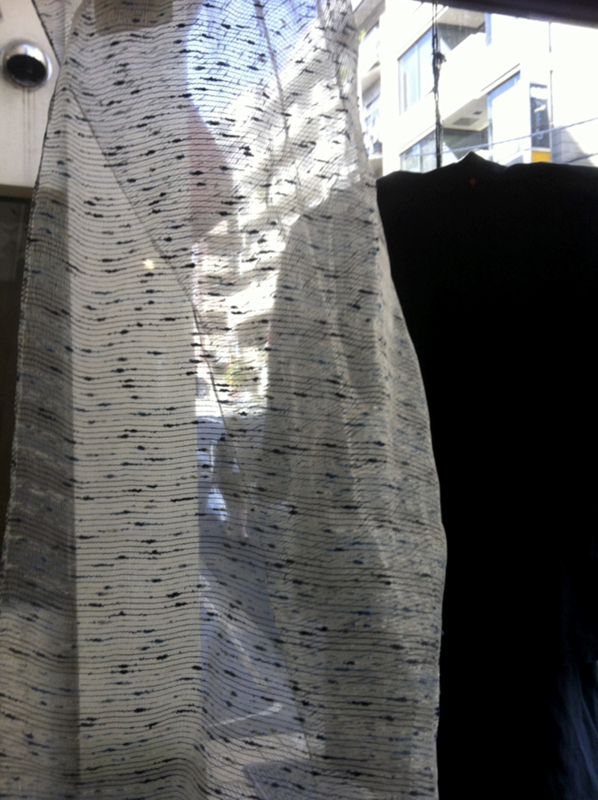 And the last, indigo and white gauze stole. 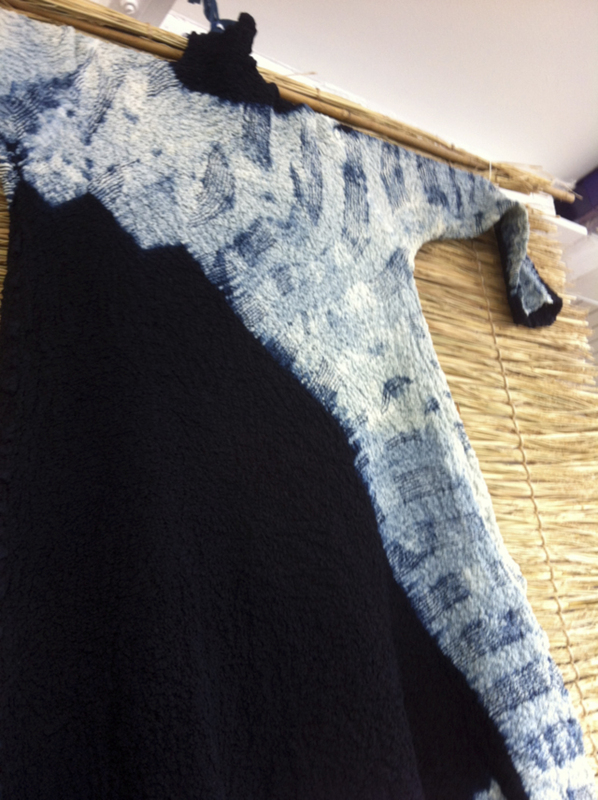 Indigo knit cotton sweater with Missoni like gradations of color. With such an arsenal of weaving and dyeing and design techniques as Kosoen has – like no other I know of in Japan – it is no wonder that they decided not to take part in the more traditional, Awa I am Ai We are Ai Project. Murata san and Kosoen have been changing the way Japan and the world looks at Indigo and championing innovation as the way of the future. Blue & White’s very reason for being is to encourage BOTH tradition AND innovation and make sure they continue to stimulate and inform each other while keeping the fires of tradition and experimentation burning bright and simultaneously. Lovely article and lovely items! Shared this on Facebook and will stop in this week to show you our quilt design. And that last paragraph sums you up perfectly!!!! You are a FORCE ! Love the quilt idea and fascinated by your newest ami obsession. I once had a fabulous Maiwai fisherman’s jacket in a glorious brilliant indigo, and the grey net was filled with large contented – I wonder why ! – grey and orange and white fish. Tai I think. It was one of the most joyful tsutsugaki I have ever had. I must have misplaced it after some exhibit. I mourn for it still, 20 years later. I think it was the ami that was so endearing ! No unlike you and your Tokyo Jinja that must go on no matter what ! I learn so much and it is beautiful to look at as well. Thank you for keeping me in the loop! I ai ai! Well, you know I love all those blue goodies. Great seeing you the other day among the blue display. Not just “like” but love! Indigo is definitely the color. The only color maybe ! 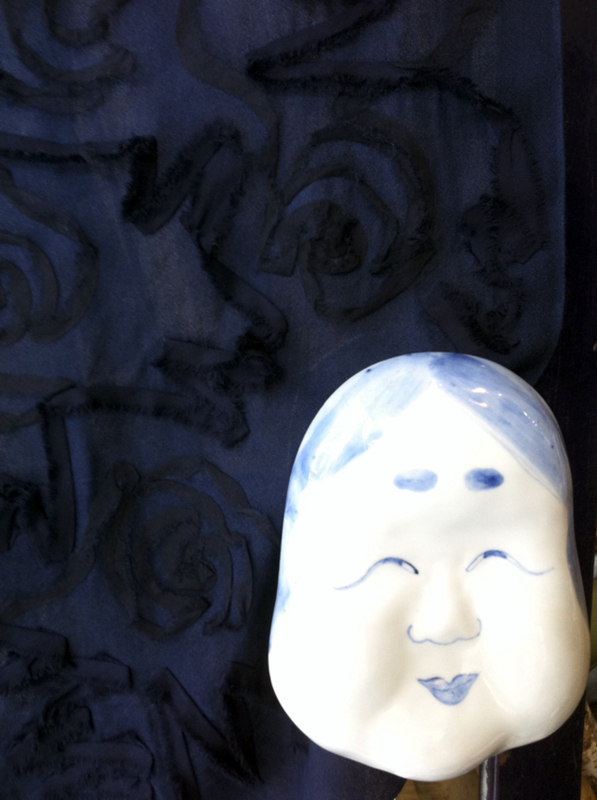 I have just completed a frivolous but passionate small folding book called ONLY BLUE, about all the blues that surround me in my life in Tokyo. Some glass, some architecture, dogs, paper, cloth – not all indigo, but all heavenly blue. It will be at Blue & White to celebrate our 38th birthday on December 8. I am glad you share my passion !